Suffield is a small village and parish in the North Norfolk Local Government District, situated some 8km inland from the coast. The parish has an area of 591 hectares, and is predominantly agricultural. The name ‘Suffield’ is thought to derived from the Old English words for southern open land. The earliest recorded monument is a large prehistoric circular pit (NHER 37729) that contained burnt flint and may have dated to the Bronze Age. It is also possible that two ring ditches in the very north of the parish (NHER 12142) may be associated with Bronze Age barrows. A Neolithic polished flint axehead (NHER 6811) and a Mesolithic flaked axehead (NHER 6813) have also been discovered. No evidence has been recovered for the Iron Age, and no monuments from the Roman period have been recorded. Despite this, a small number of Roman objects have been recovered, and these comprise coins (NHER 28819 and 39305), pottery sherds (NHER 28349 and 38148), a possible Roman key (NHER 14980), and a brooch and a mount (NHER 39568). Excavation in this parish has also discovered evidence of a number of narrow ditches (NHER 37729) that are thought to be the remains of a field system dating to the Late Saxon period and containing Late Saxon pottery sherds. Other Saxon period objects have also been recovered, including fragments of an Early Saxon brooch and Middle Saxon pin (NHER 14980), and two Late Saxon strap ends (NHER 38148 and 39568). The Domesday Book indicates that by the end of the Saxon period the village was a thriving community, and the value and presence of two mills indicate that the land was productive and fertile. 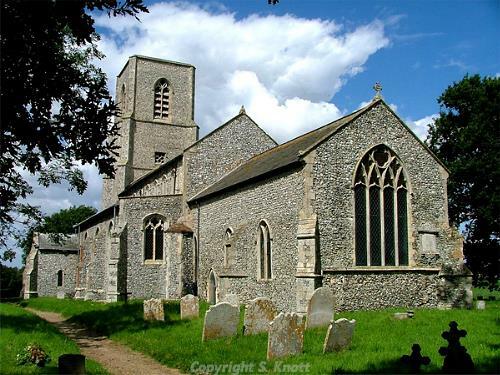 Although no church is mentioned, by the 13th century parts of the church of St Margaret had been built (NHER 6822). The church itself still contains a 13th century chancel and a handsome double piscina of Purbeck marble, as well as a particularly interesting painted screen from the 15th century and later. The cropmarks of a trackway, enclosures and possible mill (NHER 28819), as well as some evidence for a medieval field system and ditches (NHER 37729) are the only other monuments which may have a medieval date. Objects from the medieval period have been recovered, including pottery sherds (NHER 38148), coins (NHER 39305 and 39568), a number of horse harness studs (NHER 25991 and 28296), and a cauldron fragment (NHER 28349). Similar objects from the post medieval period have also been recovered, as well as a seal matrix (NHER 39305). There are a small number of buildings of architectural interest, one of which is Suffield House (NHER 13238), which dates to the 18th and 19th centuries and has a sundial thought to date to 1661. Also of interest is Hall Farm (NHER 13239), which is the remains of the Elizabethan period Suffield Hall. Of interest from more recent history, is the site of Felmingham Mill, a post medieval windmill converted to steam power in the 19th century, and the Old School House (NHER 47374), which is a 19th century school surviving as a domestic residence. World War Two also left its mark on the parish, when a decoy airfield for RAF Coltishall was situated here (NHER 14980), as well as a searchlight battery (NHER 12142). Today the only thing that remains is an interesting semi-sunken pillbox structure (NHER 17785).